The flower shop was on the south side of town. Tom would stop by on his way home from work on Fridays. One particular Friday there was a new sales clerk working in the store who did not know Tom. He entered and looked around as usual. He asked for several flowers to be prepared and wrapped. He told the clerk that they were his wife’s favorite. The prayer of thanksgiving permeates the celebration and is a reminder that we are called to offer thanks by the way we live our lives. Today the readings for Mass also center on this theme. The Gospel passage has Jesus continuing his journey to Jerusalem where he will lay down his life for the salvation of the world. Along the way he cures 10 lepers who cry out to him: “Jesus, Master! Have pity on us!” Jesus tells them to “go show yourselves to the priests.” On the way they are all healed. When one of them realizes this, he turns and goes back glorifying God. When he finds Jesus he falls at the Lord’s feet and thanks him. The other nine did not. Jesus comments on this “Ten were cleansed, were they not? Where are the other nine? Has none but this foreigner returned to give thanks to God?” Jesus then says to the former leper: “Stand up and go; your faith has saved you.” The man returned to Jesus because he recognized from whom the gift of healing had come. His actions are in sharp contrast to the others who had been healed. When we think of it the percentages are pretty stark. Ninety percent failed to give thanks. The failure to give thanks leaves a certain invisible void. Something is missing. Jesus points out the absence of the nine not so much because he needs their thanks but because they need to offer thanks. Naaman, in the passage from Second Kings that serves as the first reading for the liturgy, is likewise cured of leprosy. Elisha was the mediator of this cure. You may recall his instruction to Naaman to go and wash in the Jordan. Naaman was indignant, expecting a cure to be filled with spectacle and grandeur. Hesitatingly, and after some urging from his companions, he did as Elisha had told. Naaman is thankful. He also recognizes that this thanks has to continue in his worship of God, and so he asks Elisha to permit him to take “two mule-loads of earth” back to his homeland. His worship of God, in thanksgiving, will continue as he leaves Israel for his homeland. Thanksgiving is a very important part of human life. We have the ability to give thanks and to express gratitude. Gratitude helps us recognize the blessing of life and all the gifts, great and small, that God has given us. The liturgy not only expresses that thanks but calls us to be transformed by it so that the whole of our life may be an act of thanksgiving. 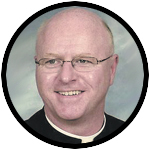 Thank you Msgr Prior! Reflecting on your homilies are right on! I am studying at Saint Charles Seminary in the permanent deaconate formation program.